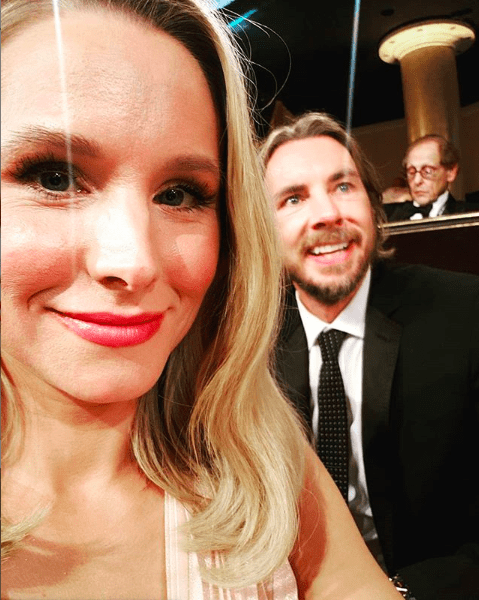 Pretty much everyone loves celebrity couple Dax Shepard and Kristen Bell – mostly because they don’t really act like a celebrity couple (and also because they’re hilarious). This year, Bell’s comedy The Good Place was nominated for an Emmy, and Bell herself was up for her first Globe for her role as Eleanor in the comedy. Aside: If you’re not watching this show, you should be. It is, in my humble opinion, the best comedy on television (it was a close one, Brooklyn Nine-Nine). While some actresses would be anxiety-ridden and spending the day angsting about walking the red carpet looking perfect, the series of videos posted to Instagram by Bell show a different attitude in their home. Starting with this image, wondering whether everyone prepared for wearing a formal gown by eating as much food as they wanted (and more than they needed). And basically making all of us fall in love all over again. As for Shephard, he’s a guy so, you know. He stuffed himself into a tux and got the hell on with it. Though neither Bell nor The Good Place won, I stand by my assessment. Sure, you have to watch network television for a half an hour, but it’s totally worth it.